Mariel de Leon is now an official candidate of Binibining Pilipinas 2017, her second bid for the crown after making it to the pageant's Top 15 in 2013. Mariel de Leon beams with pride on announcing that she's "now an official candidate for Binibining Pilipinas 2017!" in her Instagram post earlier today, March 1. The fourth child of Christopher de Leon and Sandy Andolong is making her bid for the crown for the second time. She made it to Top 15 in Binibining Pilipinas 2013. In her post, Mariel thanks everyone for "all the love and support that I have been receiving." The culinary exoert is especially grateful to her family "for always 100 percent supporting me in whatever I want to pursue. "Thank you for always making me feel so loved and cared for." "She's with me everyday and she waits for me the whole day! Love you Ate! Here we go again." "Thank you of course to my @aces_and_queens family for teaching me everything I need to know and for guiding me towards my goals. "I'd be lost without you!" The 5'9 stunner adds, "Thank you of course, to God. "Thank you for this for all the blessings that You continue to pour into my life. "I trust in You and Your plans for me. "I am so blessed and overwhelmed by Your generosity and Your love for me. "You make me glow from within. "I am nothing without you. I love you!" This year's beauty pageant is set to happen in April. In her previous interviews, Mariel had been very vocal about wanting to be a beauty queen. Her mom Sandy, meanwhile, fully supports her daughter in her new journey. In a separate interview with PEP.ph (Philippine Entertainment Portal), the celebrity mom has said, "Buo ang suporta ko sa kanya, kasi yun talaga ang gusto niya, e.
“I-honor niya ang God sa lahat na lakad niya, lahat na ginagawa niya, sa lahat na sinasabi niya. She also denied Mariel had cosmetic surgery, saying she only lost weight as prescribed by beauty queen maker Jonas Gaffud of Aces and Queens. 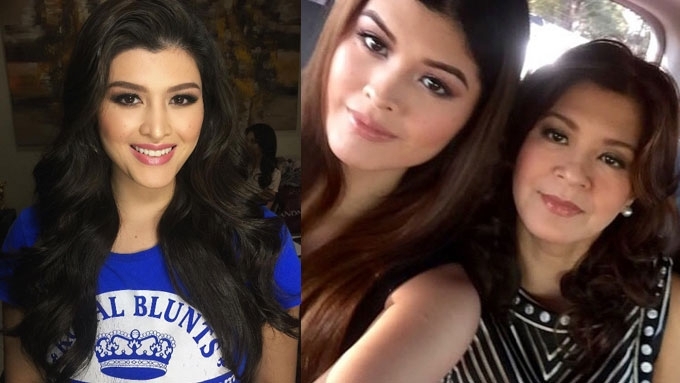 Read: Sandy Andolong assures her daughter Mariel de Leon is au naturel: "Walang opera 'yan, natural 'yan."